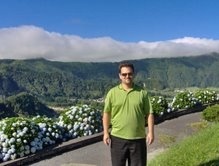 Furnas is another area of Sao Miguel Azores that is a must see. I remember my first visit to the area, I was stunned to see Geo thermal activity first hand. As you walk near Furnas lake there are areas of the ground that actually bubble because steam is working its way up. It is in this area where you can actually bury a pot of food in the ground and it will cook for you! More on that soon. The other part of my first visit to the area that I remember vividly are the large holes in the ground with fiercely bubbling water. These are called calderas and you would not dare to step too close to them as it is obvious danger. They produce quite a bit of steam and have a sulfuric smell. When I first brought my daughter there she sat on my shoulders with her nose plugged! It's really not bad, you really only smell it when you are right by it. Move away a few steps and you can't smell it. 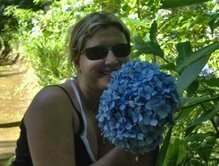 Speaking of smells, take time to smell the hydrangeas! There are over 20 thermal springs in the town and lots of evidence of geo-thermal activity. The town itself has some wonderful homes built in an era when the wealthy residents of the island were building homes there. And there are plenty of beautiful gardens to observe right in the town. I recommend taking a stroll through out the town. Have a little patience when driving in and out, it is easy to turn the wrong way and end up where you started! Actually I have found it easy to do that in many parts of the islands. One of my uncles is famous for his "adventures" - just another word for getting lost! But remember, you're on vacation and taking a wrong turn won't lead to any trouble, just seeing a new sight. Lagoa das Furnas is a very scenic place to visit. If you plan your visit you can even have a meal there that is cooked right in the ground! This is called a Cozida . Cozidas are basically a stew of meats and vegetables mixed together in a pot. The pot is put into the ground and a few hours later it is cooked. I have had this many times and have always been very happy with the meal. It really is interesting to watch your pot of food placed in a hole in the ground, explore the area for a few hours and then go back to get your food and have a nice meal. The lake itself is the second largest, freshwater lake on San Miguel Island. It is just under two square kilometers. This is a potentially active volcano and on my last visit there I was amazed by something I had not noticed before. I went out on a pedal boat with my wife to enjoy the sun and see the area from a new perspective. When we got out a fair distance from the beach we noticed a long line in the water that looked a bit like the wake of a boat. When we got closer we realized that it was actually bubbles coming up. There is a straight pathway of bubbles about 1 meter wide by about 1500 meters long (judging by the lakes dimensions of 2025x1600 meters). The paranoid part of me started to think that maybe this was dangerous! When I got back to shore my father assured me that it has always been that way - well at least as long as he remembers. And the last eruption in this volcano occurred in 1630. Anyhow, it's really quite a sight to see. My research since this last visit tells me that the calderas (thermal springs) on the shore reach temperatures of 61.5 degrees Celsius (42.7 F). It's simply amazing to see in person and be in awe of the power of mother nature. It is quite possible to hike all the way around the lake. Plan for a couple hours of walking. On the far end of the lake (from where you would park by the beach) is a church worth checking out up close. After visiting the lake it is worth taking a detour on your way out. As you drive out along the road beside the lake (the only road out) you will eventually have a chance to turn left. If you turn left and then left again you will go up the hill and to the top of the crater. From there you will have a fantastic view of the lake, the town, and all of the crater. 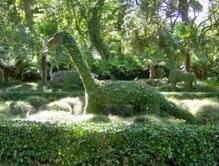 If you like gardens this is a must see on San Miguel. 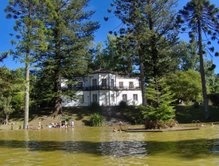 Terra Nostra Park is in the town of Furnas and is quite beautiful. There are a wide variety of trees, bushes and flowers planted and well cared for. 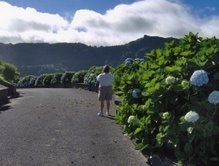 Of course there is an abundance of hydrangeas like everywhere else on the island. The walk ways are carefully tended, there are man made streams to follow, water fountains and some interesting sculptures. Oh, and I nearly forgot to mention the pool filled with mineral water and fed by a hot spring! I should mention that there is a nominal fee of a couple of Euro's to visit this park and it is well worth it.